Carrying part of President Obama's convoy back to the US after a visit to Costa Rica. When the C-17 started taxiing for takeoff the sun went behind this cloud, I quickly set up the camera for a backlit shot and waited for the takeoff. Fortunately the C17 flew right into my "trap"! That is one very good shot !! Lovely background against this awsome (and huge) aircraft. 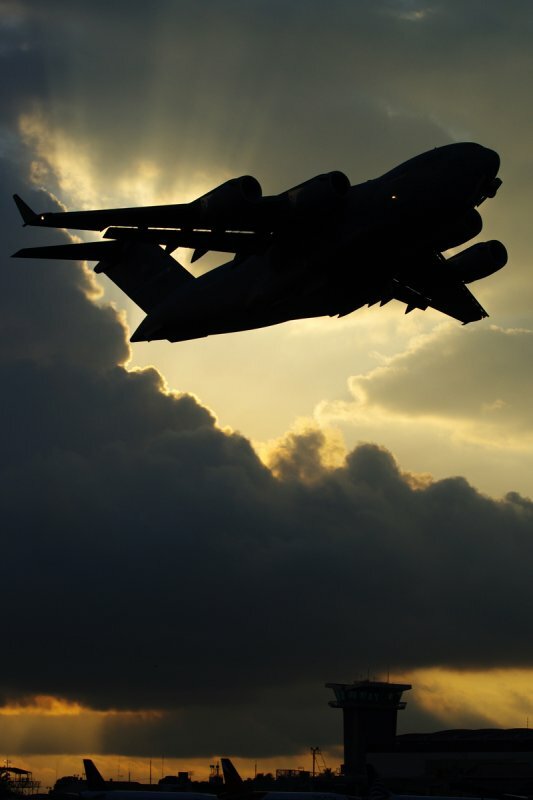 BTW, I was watching a show, right this week ... "Mighty Planes" and this C17 was the star of the show. Impressive image, aircraft, and sky. That's awesome, the way the sun beams burst out of the clouds in the same direction as the plane. I don't think this could have been done any better even if you had complete control over the sun, the clouds, and the plane all at once. Thank you for your kind words! This was just one of those "right time, right place" moments, and just before the airplane took off I saw the cloud and the sun rays and decided for a backlit shot, just hoping that the airplane would fly into place. I moved a little looking for a lower shooting angle and just waited a few seconds, and that's the result. Thanks again! That's some shot, well done. Great shot...I get to see them all the time so good for you. Excellent capture. Well done. I feel the crop could have been less tight though since the environment/surroundings provide most influence. Definately right time and right place, but it takes some skill to be able to be ready for those moments. Great Job! so I didn't really have a lot of room to work, but I do agree with you about the crop. Thanks!